As Sussex gear up to face Gloucestershire tomorrow (1 August) we take a look at the Sharks' next opponents. Big Hitter: Residents of the flats at the Ashley Down Road End of the Brightside Ground have become used to ducking on their balconies when Michael Klinger is facing bowling from that end. The hugely popular Aussie has proved himself one of the most outstanding overseas signings in county cricket during his years of service with Gloucestershire and arrived for his latest stint this week. Klinger loves targeting the flats because of the relatively short boundary when hitting straight and can be counted upon to test the strength of the glass windows again. Key Bowler: Andrew Tye misses the opening two South Group fixtures against Somerset and Middlesex because of commitments with Australia, but the 31-year-old seamer can still be a major figure in Gloucestershire’s attempt to win the competition for the first time. 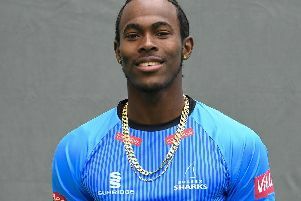 A member of Australia’s T20 squad since 2016, having not made his debut in State cricket until the age of 26, Tye is renowned for his death bowling and the ability to produce devastating yorkers under pressure. His bag of tricks includes many variations and his career has hit new heights since he last played T20 cricket for Gloucestershire two seasons ago. Wild Card: Ryan Higgins drew himself to Gloucestershire’s attention by smashing 68 not out off 28 balls to earn Middlesex a tie against them at Cheltenham in last season’s competition. While the College Ground is relatively small, the now 23-year-old all-rounder’s 6 sixes and 4 fours turned a game the hosts appeared to have under control when reducing their opponents to 119 for eight in reply to 182. Since switching clubs, Higgins has been a success with bat and ball. Now comes the opportunity to produce the fireworks Gloucestershire supporters who watched him at Cheltenham have been anticipating.